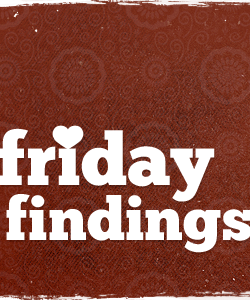 Okay, so you may have noticed that last Friday there were no Friday Findings to speak of…sorry about that. But, today, I’m here to make up for that fact with an extra awesome and extra long list of gems and goodies. Wake Up for Your Kids. No post has convicted me as much as this post, in quite some time. I have been hearing the Lord gently directing me in this and then I stumbled upon this post. It was confirmation of the changes I need to make at home. Logical Fallacies. If you are a theological, analytical, or heck, argumentative type, you’ll probably find this site hilarious. It helps you call people out on the most common logical fallacies. Genius. Not so grace-filled, but genius nonetheless. Oh, Dave. Save It. Are you a Dave Ramsey fan? I sure am. I took a Financial Freedom class in college and have never thought about money the same way since. This post, however, challenges much of Ramsey’s teachings and does so in a loving, truth-filled, and honoring way. A good read. 10 Steps to Sanctification. The Barna Group, A.K.A. the Christian research top-dogs, is soon-to-be-coming out with a book that suggests that each of us can trace our spiritual journey in 10 steps. Sound hokey? I’m not sure either, but I’m intrigued. Mary, the Bondservant. Do you ever think about Mary? I do and quite often, in fact. I imagine the angel standing before her explaining that nothing, including the world, would ever be the same. Well, Rebecca at her blog The Upside Down World, wrote a lovely and compelling post about the mother of Jesus. One of my personal favorites this week. Rule Breakers Unite. I’ve mentioned Alice Bradley here before. She is, without a doubt, one of my favorite blogger/writers/funny ladies. Calling her hilarious is an understatement and writing funny–consistently funny–is so hard to do, but, posts like this continue to make me laugh out loud. Love me some Frank. If you’ve been around this blog more than once, you probably know that I have a great deal of respect and admiration for Frank Viola. So, it is easy for me to recommend anything he has written…and of all his 13 books, each one is priceless. That being said, his new book, Beyond Evangelical, is now available (I cannot wait to get my hands on a copy). Another of his books, Revive Us Again (one of my favorites) is also available for a discounted price. BONUS: It is a signed copy from Frank himself. Score. Alright my friends, lay it on me…What caught your eye this week? What did you read that you just have to share? What did you read that made your skin crawl? What else is going on? Anything? Logical Fallacies…LOL! So enjoyable and yet so true! Wow, that article about anxiety was so interesting!